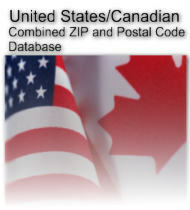 Basic geocoded United States 5-digit ZIP and Canadian Postal Code data. This product contains all United States ZIP codes and Canadian postal codes in a single package. Contains over 800,000 records. Each record contains the ZIP or postal code, the preferred city or location name with state or province abbreviation and associated latitude and longitude coordinates.